The Indian Chinese Association: Ni Chi Le Ma ? Ni Chi Le Ma ? You went to China? What did you eat ? Did you eat cockroaches?“ I believe I am not the only China-return who has faced this question from a naïve (or cheeky) friend, relative or acquaintance. 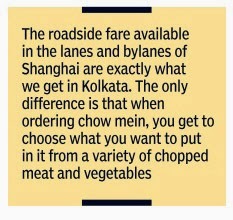 Kolkatans may take immense pride in their love for `Chaineez' food -from the ubiquitous chow mein-chilli chicken and roadside momos to the fancy spreads at Tangra or the `Chinese breakfast' in Tiretta Bazaar -but when it comes to authentic Chinese food, the idea is, at best, vague. 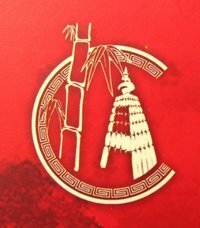 Everybody knows that what we are dished out in Kolkata as `Chinese' is a unique brand of cuisine altogether that has now come to be known as Indian Chinese (or even `Kolkatan Chinese').But what is `Chinese Chinese' food like? Most of the answers I had always got boiled down to something like “it's bland, hence it's inedible“. And then, there were the great `cockroach' theorists. So, when I landed up in Shanghai armed with this vague idea, I didn't really know what to expect at mealtime.But what I ate for the next 10 days shattered all theories (and apprehensions).I neither found the food bland, nor inedible. And there were no cockroaches either, much as I would have loved to try it out. It was just, well, different. First, let's understand one thing.There's nothing called `Chinese cuisine', just like there can't be an `Indian cuisine'. Both are huge nations and have diverse food habits varying from region to region. So, there are Hunan, Cantonese, Szechwan, Anhui, etc, with their individual tastes and flavours. To give a rough idea about Chinese regional food, it's said that the `north is salty, south is sweet, east is hot and the west is sour'. I got the chance to try out food from the east and north. To start with the basics, the Chinese are voracious meat-eaters -mainly pork and beef. And this is what creates trouble for most Indian tourists, since members of two of our largest religious communities don't eat at least either one of the two. To add to the trouble, you may not even have a clue all the time about what you're eating. Most restaurant and hotel staff -even in the bigger cities like Shanghai, forget the provinces -don't speak or follow English. So, when eating Chinese in China, it's best to go with an open mind. Most of the meat dishes are dry in nature and come in bite-sized pieces or slightly larger -possibly to make it easier to eat with chopsticks, which makes it impossible to slice things.There's usually a dip to go with it. If anything comes in gravy or a sauce, it's meant to be eaten with rice -the sticky variety -off a bowl, not a plate. Unfortunately , China is no country for vegetarians. The pure veggie platter did not offer much apart from bok choy (Chinese cabbage), mushroom, tofu, lotus stem, seaweed and the occasional potato or eggplant, apart from fruits. Even chicken did not seem too popular. Cockroaches or not, the Chinese do eat some quirky stuff -and the origin of many possibly goes back to the days of famine in the late 1950s and early Sixties. Even today , a less common and very personal form of greeting in China is “Ni chi le ma? ", which literally translates to “Have you eaten?“. It dates back to the famines, when nothing meant more to a well-wisher than whether a person had had a plate of food. A couple of strange dishes were on offer at Datong city in north China's Shanxi province -sheep's hooves and rabbit's head. Rabbit's head might be a great delicacy to its aficionado, just as the rui maachher muro is to the die-hard Bengali, but to a novice, it's just as messy an experience. Same goes for the hooves. Talking about maach, one of the best dishes China has to offer is perhaps the Mandarin Fish. When we were served the fish for the first time in Shanghai, none of us could muster the courage to even touch it. It was an entire fish floating in a very watery sauce, looking completely raw and looking up at us mournfully . But when we did try it, we got a fantastic little surprise. A little poke with the fork, and the fish flaked off like butter off the bone. It was soft and juicy , with a subtle flavour of the sauce, which can be of several types. Only one warning: the fish can be a bit smelly at some places. Datong, too, had a lot of seafood to of fer -strange, because Shanxi is landlocked. C l a m , o y s t e r, whelk, prawn, squid, fish the spread was quite impres s ive. B e i n g only two and a half hours' d r ive f ro m Mongolia, Da tong probably has some Mongolian influence in its food, which is comparatively hot as well as sour. Vinegar -a Shanxi speciality -is used liberally in its food. The Mongolian influence is also apparent in the `hotpot', a meat-and-vegetable stew that is served on a low flame -much like a fondue. Possibly a result of its harsh winters, a hotpot is a musthave if you are in northern China. Unlike in the south, where rice is the staple, in the north it's supplemented by wheat dough-based food, like noodles and dumplings. 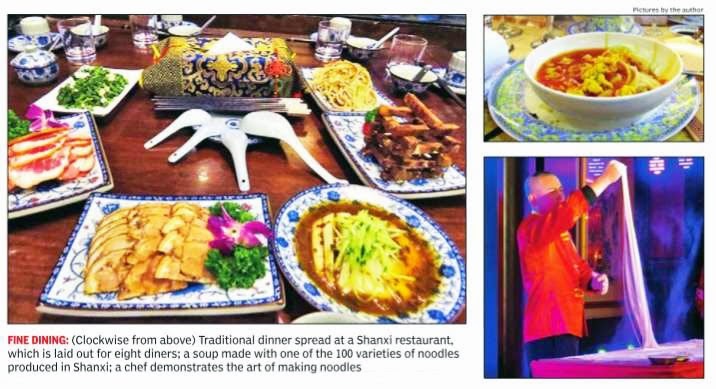 Shanxi alone produces more than 100 types of noodles, including some spectacular visual treats like the transparent glass noodles. Coming to noodles, the one thing in which the Kolkatan Chinese comes very close to the authentic Chinese is its street food. The roadside fare available in the lanes and bylanes of Shanghai are exactly what we get in Kolkata -chow mein and momos (or dumplings). The only difference is that when ordering chow mein, you get to choose what you want to put in it from a variety of chopped meats and vegetables. The street food is comparatively spicy too. And the tastes and flavours are far more pronounced than what is served at the restaurants. The hallmark of Chinese food lies in its subtleness. The sweet is not too sweet and the sour not too sour. And that holds true for desserts, too. Speaking of dessert, China has some delicious varieties to offer. They are never too sweet, but have a distinct delicate flavour. Do check out the sesame cakes and pastries from the local bakeries and almond jellies when in a restaurant. Finally , the drinks. The Chinese wash down their food with large quantities of green tea, which again has an extremely subtle flavour. Don't expect water at meals; if you ask for it, you're likely to be served scalding hot water. Non-teetotallers, do try the Baijiu, perhaps the most popular Chinese alcoholic drink. Its name changes from region to region. For instance, the one in Shanxi is called Fenjiu, named after the local Fen River. It's not too expensive and comes in some pretty packages that you can save as souvenirs. And don't forget to raise a toast as many times as you can when dining with Chinese friends. So, Kolkatans, when in China, do eat Chinese. Trust me, there won't be any roaches.